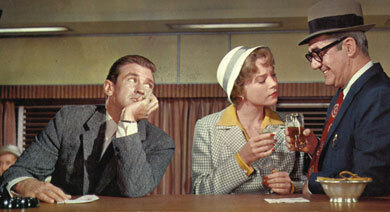 Rod Taylor plays Ross Tayford in this lively romantic comedy, with Shirley MacLaine as the object of the romance. It's yet another early supporting role in which Taylor steals the show from the top-billed actors. Tayford is the first pursuer of Meg Wheeler, an innocent 19-year-old from Pennsylvania who arrives in New York City to land a job -- and maybe a husband. They meet cute, he charms her through two months of dinners and dancing, without a kiss. When he finally makes his move, it's to invite Meg up to his aunt and uncle's house in Connecticut. She thinks it's to meet his family and get engaged. The wolfish Tayford, of course, has other ideas. The scenes at the Connecticut house bring the comedy to a high point before the leading men -- David Niven and Gig Young -- even figure into the picture. Taylor and MacLaine practically dance through a carefully choreographed sequence of tricky embraces and escapes, clever lines and kisses. Once Meg goes to work for the Doughton brothers (Niven and Young), the romantic plot thickens. Never fear, however, Taylor does make some welcome re-appearances. Taylor is predatory ... a young man with a more direct approach. As an actor, he's worth marking; he's different.